Download templates for accurate drilling of the mounting holes for installation of the LED rear light units. The range of LED lighting upgrades for classic motorcycles available on this website are designed to fit neatly inside the original Lucas tail lamp units. In order to make it easy to position the LED light board and identify the correct locations to drill the mounting holes, the following templates are provided. Each of the different templates can be downloaded by clicking the respective link in the table below. Guidance for printing, checking and cutting out the paper templates is provided in the printing instructions section at the bottom this page. A full step-by-step guide is also provided for installing the Lucas 564 LED light boards and you should read this through carefully before starting work. There are slight variations between the different LED light board models which may not be obvious, so please ensure that you use the correct template for the light board model you are installing. Once you have downloaded the appropriate mounting template for your LED light board you should then print it out onto A4 paper. The PDF file is correctly scaled so as long as you print it out at full size (i.e. at 100%) the image should be of the correct dimensions. You can verify this by measuring the 100mm scale line which is included below the circuit board outline in the template. As an additional check, the circuit board itself should measure 80mm across and 40mm top to bottom at the widest centre point. Cut out the LED circuit board template leaving approximately 0.5mm or so around the outline so that this is still just visible. You may also find it useful to stick the printout to a piece of card before cutting out the board so that you have a more rigid template to work with. Finally, pierce the template in the centre of the two drill hole locations so that you will be able to mark through the template and onto the rear reflector of the Lucas lamp to be drilled. When positioning the template on the rear reflector, ensure that the printed side faces outwards and that the “TOP” is at the upper corner. Some models of the LED light boards have the mounting holes slightly off-centre in order to give better routing of the conductive tracks and electrical components. This may not easily be visible by eye, but it will make all of the difference when it comes to fitting the LED light unit inside the Lucas lens! 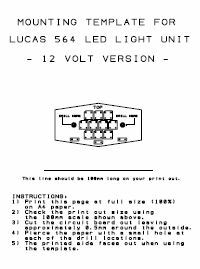 Please refer to the Lucas 564 LED light installation guide for full step-by-step instructions for fitting your new LED light unit.